I think we can all agree that stand up is pretty difficult? Billed as ‘Stand Up without a Safety Net’, it has been observed that Set List makes something already challenging for a performer, even more difficult. It puts the comedian on the spot by giving them five minutes to improvise a set, based on topics displayed on a screen, revealed to performer and audience simultaneously. The format arrived via America, has been embraced by television, and so acquired a patina of edgy subversiveness, where the expectation is that matters will get dark and dirty. In the UK the faux genteel ‘Just A Minute’ on BBC Radio 4 has being doing pretty much the same thing for the last 50 years and there you can’t pad it out with swearing and sexual stories, pause or repeat yourself. Tonight’s cast was Australian comedy royalty, Greg Fleet and Akmal topped and tailed the bill, with Tom Ballard, Lori Bell and Luke McGregor also stretching their necks on the block. The audience confidence in the evening depends on excellent hosting skills, and there is no finer man for the job than Gordon Southern who engaged the audience and kept the funny in the room when at times it seemed in danger of slipping away when the improvisers floundered with topics that seemed to come from a random word generator ‘testicle elephantiasis kick boxing class’, ‘sloth butter’ and various meaningless acronyms. It could work better with less obtuse subjects and nonsense words; the task is hard enough as it is. Most polished was opener Greg Fleet, most phased Tom Ballard and most amusing Luke McGregor – whose expressive face and awkward body language communicated funny at the speed of light rather than sound. Set List continues at Rhino Room – Upstairs until Sat Mar 14. Rhino Room – Upstairs, Sat Feb 14 I think we can all agree that stand up is pretty difficult? 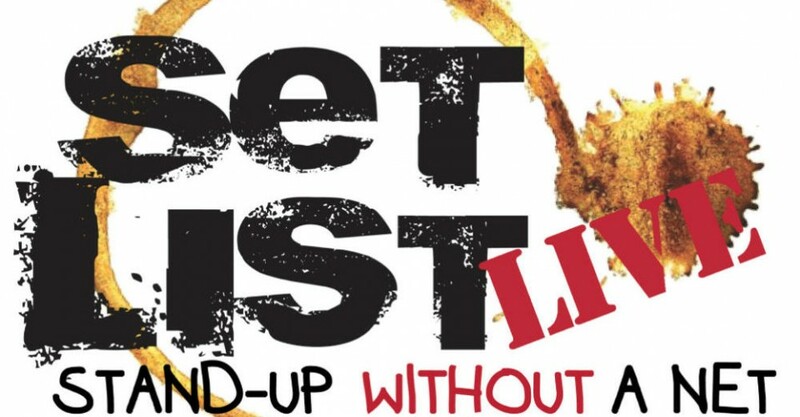 Billed as ‘Stand Up without a Safety Net’, it has been observed that Set List makes something already challenging for a performer, even more difficult. It puts the comedian on the spot by giving them five minutes to improvise a set, based on topics displayed on a screen, revealed to performer and audience simultaneously. The format arrived via America, has been embraced by television, and so acquired a patina of edgy subversiveness, where the expectation is that matters will get dark and dirty. In the UK the faux genteel ‘Just A Minute’ on BBC Radio 4 has being doing pretty much the same thing for the last 50 years and there you can’t pad it out with swearing and sexual stories, pause or repeat yourself. Tonight’s cast was Australian comedy royalty, Greg Fleet and Akmal topped and tailed the bill, with Tom Ballard, Lori Bell and Luke McGregor also stretching their necks on the block. The audience confidence in the evening depends on excellent hosting skills, and there is no finer man for the job than Gordon Southern who engaged the audience and kept the funny in the room when at times it seemed in danger of slipping away when the improvisers floundered with topics that seemed to come from a random word generator ‘testicle elephantiasis kick boxing class’, ‘sloth butter’ and various meaningless acronyms. It could work better with less obtuse subjects and nonsense words; the task is hard enough as it is. Most polished was opener Greg Fleet, most phased Tom Ballard and most amusing Luke McGregor – whose expressive face and awkward body language communicated funny at the speed of light rather than sound. Julia Chamberlain Set List continues at Rhino Room – Upstairs until Sat Mar 14. Book at FringeTIX on 1300 621 255 or adelaidefringe.com.au/fringetix. Click HERE to purchase your tickets. "Comedy royalty put on the spot."